I dealt with Kotetsu´s career in detail in my Legends and Stories around the Japanese Sword 2 and also presented at the end of this chapter what we know or what is speculated about his scholastic background. Now I wan´t to introduce a blade from his very early years as a swordsmith which can be seen as a strong indication that he was trained by an Echizen-based master. But first and to get familiar with the great Kotetsu, let me quote the essential parts from my aforementioned publication. Let us begin with the facts or the historic records respectively. The works Ômi-ochiboshi-shû (淡海落穂集), Ômi-kojin-dan (淡海 故事談) and Kobayashi Zui´ô hikki (小林随翁筆記) write that Kotetsu was born in Nagasone (長曽祢) in the vicinity of the castle town Sawayama (佐和山), in Ômi province. This transmission is also followed by the Hikohan narabi Kingô-ôko kikigaki (彦藩並近郷往古聞書) but which goes somewhat more into detail. Therein we read: “According to a transmission, Kotetsu lived until recent years in Nagasone but came originally from the Northern provinces. The time is around the Kanbun era (寛文, 1661-1673).” Interesting is the wording “until recent years” which implies that this work was written not too long after Kotetsu´s death in Enpô six (延宝, 1678). Unfortunately, all those mentioned records are undated. 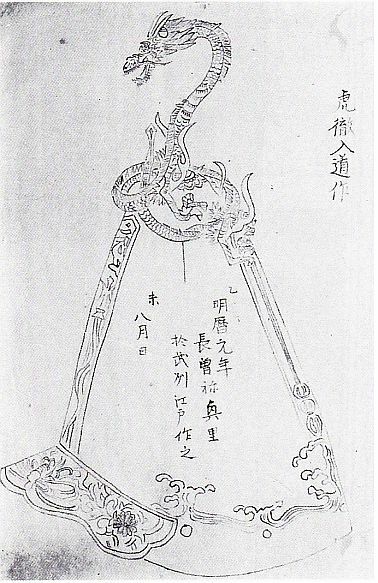 Some sword-related documents were published shortly after Kotetsu’s death. The Arami-mei-zukushi (新身銘尽),for example, was published in the sixth year of Kyôhô (享保, 1721), i.e. 43 years after his death. Therein we find the information: “According to transmission he once lived in Echizen but originally came from the village of Nagasone in Ômi province. Later he moved to Edo.” The author of the Arami-mei-zukushi, which deals exclusively with shintô blades, was Kanda Hakuryûshi Katsuhisa (神田白龍子勝久, 1680-1760). Katsuhisa was a renowned and busy scholar and chronicler who compiled several 20, 30 and 40 volume publications. He was a friend of the 8th Tokugawa-shôgun Yoshimune, he visited several fiefs for his studies, and talked to many swordsmiths. So it can be safely assumed that his entry in the Arami-mei-zukushi represented the then knowledge on Kotetsu. Kamada Natae (鎌田魚妙) also follows up in his standard work Shintô-bengi (新刀弁疑) from the sixth year of An´ei (安永, 1777) the approach that Kotetsu came originally from Nagasone. The other, often quoted, approach that Kotetsu came originally from Echizen goes back to extant signatures with the prefix “Hongoku Echizen-jûnin” (本国越前住人). Sword books, like the Honchô-shintô-ichiran (本朝新刀一覧) from the fourth year of Bunsei (文政, 1821) and the Tôken-jitsuyô-ron (刀剣実用論) from Bunsei seven (1824), interpret this prefix wrongly. They confuse namely the term hongoku (本国, “home country/province”) with shōkoku (生国, “country/ province of birth”). In short, hongoku does not necessarily mean that a person was also born in this country but simply that he or she lived or had lived there for a longer period of time. The question is now why Kotetsu signed explicitely with the supplement “Hongoku Echizen,” i.e. “home country/province Echizen”? The most obvious reason would be that Kotetsu considered Echizen as his home country because he had left Nagasone at a very young age. But there might also be another reason. After the Battle of Sekigahara, Ieyasu had entrusted Echizen province to his second son, Yûki Hideyasu (結城秀康, 1574-1607), who made the local Kitanoshô Castle (北ノ庄城) his stronghold and who reverted to the former family name “Matsudaira.” Kitanoshô became Fukui Castle, which also served as a name giver for the surrounding fief. So Fukui was, because of its direct connection with the family of the shôgun, a high ranking fief and smiths like Yasutsugu (康継) were proud to mention in their signatures their relationship with it or their patronage by this Tokugawa branch. And “Echizen” became, for example “Echizen Yasutsugu” (越前康継), an inseparable pseudonym of this master. The Ômi-kojin-dan writes about the family name “Nagasone”: “The Kotetsu family lived in Nagasone since the time of his great-grandfather and up to Kotetsu all of them used the name of this village ´Nagasone´ as their family name.” The next question which arises is when and why the move to Echizen province took place. A theory says that Kotetsu´s father had supported the troops of Ishida Mitsunari who also came from Ômi. And when he saw that Ishida was going to be defeated at Sekigahara, he fled Nagasone and moved to Echizen to escape eventual punishment by the Tokugawa. Many contemporary swordsmiths shared the same fate. Others assume that Kotetsu´s father had chosen Echizen or rather Kitanoshô Castle because it was, back then, controlled by the Mitsunari-ally Aoki Kazunori (青木一矩, 1541-1600). This means that as he was previously employed by Mitsunari then it would have been easier for him to find a new job with a “sympathiser” of his former lord than trying his luck somewhere else in a hurry. At the same time we can also observe how other Nagasone craftsmen who had made armours, armour parts, swords, tsuba, stirrups (abumi, 鐙) and bridle (kutsuwa, 轡) scattered into the four directions. A metal worker, who signed “Nagasone Masanori Nyûdô Shôsa” (長曽祢当則 入道承佐), for example, made in Kaga´s Daishôji fief (大聖寺藩) tsuba and the swordsmith Nagasone Kawachi no Kami Nagahiro (長曽祢河内守長広) worked in Ôsaka. Let us return to Kotetsu´s career as a swordsmith. As mentioned in the first volume of the Legends and Stories around the Japanese Sword, the commonly accepted theory says that around the age of 50 he went to Edo to change his profession from that of an armourer to a swordsmith. When we examine all extant blades by Kotetsu we learn that the earliest specimen, i.e. those which are signed with “Okisato” (奥里), have a great deal in common with the tang finish of works by the Kaga smiths like Kiyomitsu (清光) and Yukimitsu (行光). Picture 1 demonstrates this and the peculiar so-called “Kashû-nakago” (加州茎). This gives the impression that he had gained experience as a swordsmith before he moved to Edo and that he maybe was trained by his Kaga relative, the aforementioned Masanori. Well, the exact reasons for Kotetsu´s change of profession are unknown but there exists roughly three approaches. One says that when he faced his 50th birthday, the demand for newly made armour had drastically dropped. Sekigahara happened 40 years earlier, Ôsaka had fallen more than 30 years ago, and the last great armed conflict – the Shimabara Rebellion from 1637 to 1638 – was at its tenth anniversary. That means there was a generation of active armourers who produced items more or less for parades and celebrations for high-ranking samurai, daimyô and the family of the shôgun or repaired extant pieces. The second approach is that Kotetsu was just looking for a new challenge. And there exists a story which gives another reason for his change of profession. This story says that he had killed a man from Echizen and was on the run. It is said that the man was a samurai from the Fukui fief who had ordered a sword from Kotetsu. When smith and customer met in the forge to talk about the finishing touches, the samurai examined the amost finished blade and complained: “Do you think I can kill anybody with a piece like this? I don´t like it and it isn´t what I expected!” Kotetsu took back the blade and grumbled: “We will see if my blade can kill anybody …” whilst cutting deeply into the left shoulder of the man. It is said that Kotetsu threw away the bloody blade and hastily abandoned the forge whilst the man died on the ground. He fled to Edo and found a safe shelter with the befriended Inaba family (稲葉). The Inaba eventually arranged for Kotetsu to be able to live and work in the vicinity of the Kan´ei-ji (寛永寺) in Edo´s Ueno district (上野). Whether from remorse or as a disguise, the smith shaved his hair and entered priesthood under the name “Kotetsu.” It is unknown if, or to what extent, this story is true but there exist some blades which do show a local connection. Picture 2 shows a katana which is signed “Jû Tôeizan Shinobigaoka no hotori Nagasone Okisato saku” (住東叡山忍岡辺長曽祢興里作, “made by Nagasone Okisato in the vicinity of Shinobigaoka at the Tôeizan”). “Tôeizan” is another name for the Kan´ei-ji. 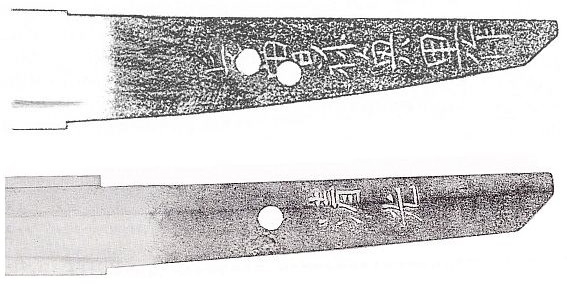 But the catch is that these blades are dated Kanbun eleven (寛文, 1671) and Enpō two and five (延宝, 1675 and 1677), that means they go back to his late artistic period. The Arami-mei-zukushi mentions “at the Honjo-Warigesui canals” as his place of residence. The Shintô-mondô (新刀問答), published by Wakabayashi Tôsui (若林東水) in Kansei eleven (1799), goes further into detail and writes: “[…] lived at the Honjo-Warigesui canals, later in the vicinity of the Ueno pond Shinobazu no Ike (不忍池) and also in Yushima (湯島).” This means that the story is nice but is probably just an urban legend. The third approach is about a helmet test which is better known in the sword world. One day Kotetsu, the armourer, competed against the Kaga swordsmith Chôbei Kiyomitsu (長兵衛清光), whose blades were famous for cutting through helmets. The whole competition ended in an official showdown with the presence of lord Maeda Toshitsune. After everything was arranged, Kotetsu stepped forward and put his newly made helmet onto a wooden pedestal. Now it was Kiyomitsu´s turn. Specially for the test he had forged a robust katana measuring 2 shaku 5 sun (~ 75,7 cm) which he brought into the overhead position. As he was at exhaling and cutting down, Kotetsu yelled: “Stop! The helmet is not in its perfect position!” Quickly he approached the pedestal and changed the position of the helmet only marginally. But the intended interruption made an impact. Kiyomitsu´s concentration on the cut was disturbed and so he was “only” able to cut 1 sun (~ 3 cm) into the upper area of the helmet bowl. The swordsmith was perplexed, markedly paler, and feared that his face was lost, even his lord rewarded both of them. Back home in his forge Kotetsu said to his adopted son Okimasa and to his two students Okihisa (興久) and Okinao (興直): “Without this interruption, Kiyomitsu would surely have cut through my helmet. This was a shabby and cowardly action on my behalf! From this day on I will retire as an armourer and devote my future life to the craft of sword forging…” It is said that he left Kanazawa, heading to Edo that very same night. As confirmed later, Kiyomitsu also left Kaga that the same night. This was found out when Okimasa fell in love with a prostitute from Edo´s redlight district Yoshiwara (吉原). This prostitute was namely Kiyomitsu´s daughter who had been sold by her father because the latter was no longer able to work because of fear of failure. Now it was Kotetsu´s turn. He tried everything to make up for his failure and so he went to his then customer, the Ikeda family (池田) from Bizen province, and asked for the unusual high advance payment of 300 ryô. When he informed Mitsumasa (池田光政, 1609-1682), the head of the Ikeda, about the reason of his demand, it is said that the lord was so moved that he granted him the advance. With this money Kotetsu was able to ransom Kiyomitsu´s daughter and marry her to his adopted son Okimasa. As so often, there are several versions of this story going round. In one of them, the competing smith was a certain Shima Hyôe Masatsugu (志摩兵衛正次) but such a name is not found in the records of swordsmiths. Others say it was not Kaga Kiyomitsu but either the 1st generation Darani Katsukuni (陀羅尼勝国) or the 3rd generation Kaga Kanemaki (兼巻). 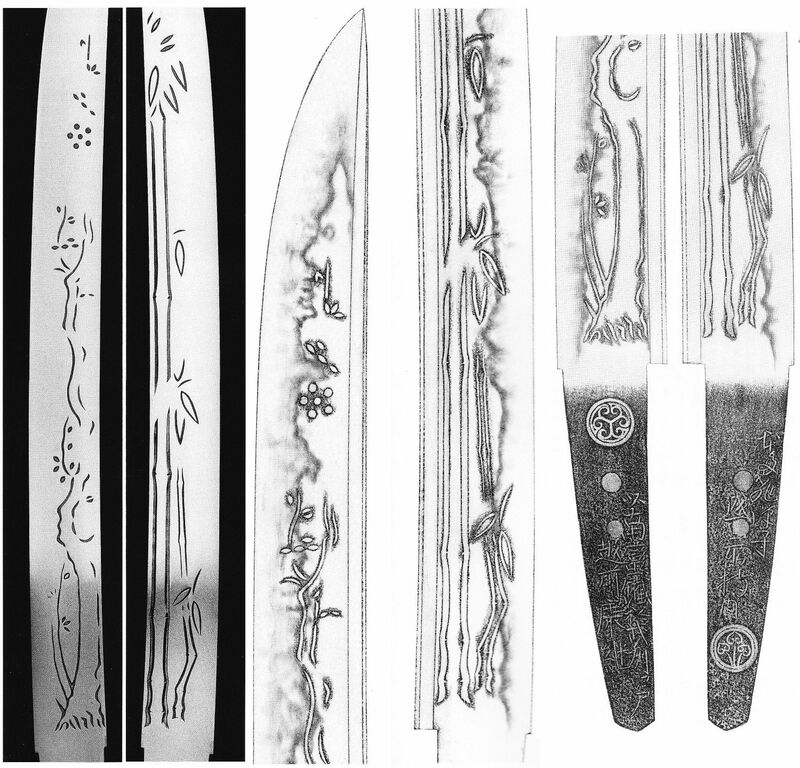 The assumption that Kotetsu changed profession at the age of 50 in Edo goes back to a signature on one of his blades. This mei reads: “Hongoku Echizen-jûnin, hanbyaku ni shitatte Bushû Edo ni kyojū-su, kaji no kôsei o tsukusu nomi” (本国越前住人至半百居住武州之江戸 鍛冶之工精尽爾) which translates as: “After 50 years in my home country Echizen I devote now myself to the craft of sword forging in Edo, Musashi.” Unfortunately, the blade – it is a wakizashi with a nagasa of 45,7 cm and a horimono of the Deva guardians (Niô, 仁王) on both sides – is not dated. But on the basis of comparative studies of other (dated) signatures – especially the interpretations of “Kotetsu” and “Okisato” – we are able to pin down the production date around the second and third year of Kanbun (寛文, 1662~63). If we take the aforementioned first year of Keichō (1596) as his year of birth, we come up with Shôhô three (正保, 1646) for his 50th birthday. 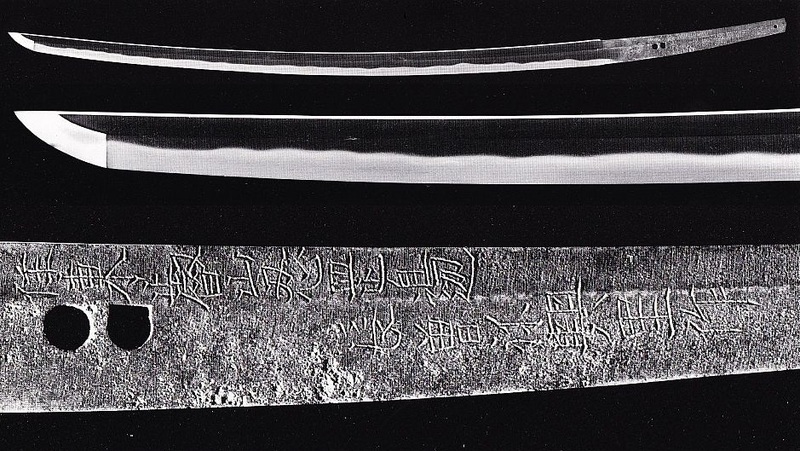 The earliest extant blade by Kotetsu with a date – another wakizashi – is from the second year of Meireki (明暦, 1656). That means now that it took him either eight or nine years until he had finally become a swordsmith in Edo, or that the year Keichô one is not correct for his year of birth. Many experts assume that, as an armourer, he only needed one or two years to start up a new career as a swordsmith. This assumption is also backed by a drawing of a helmet by Kotetsu found in Matsumiya Kanzan´s (松宮観山, 1686-1780) Meikô-zukan zokushû (名甲図鑑続編, see picture 3). According to Kanzan, the helmet bears the following signature: “Meireki-gannen kinoto-mi hachigatsu-hi – Nagasone Okisato – Bushû Edo ni oite kore o saku” (明暦元年乙未八月日・ 長曽祢奥里 ・於武州江戸作之, “made by Nagasone Kotetsu in Edo in Musashi province on a day of the eighth month of Meireki one , year of the sheep”). To summarise we can now say that Kotetsu still made helmets in Edo, in Meireki one, but two years later at the latest he also made swords. Thus, when he left Echizen in 1655 at the age of 50 – i.e. around the time he made the above mentioned helmet – then his year of birth can be calculated as Keichô ten (1605). Picture 3: Drawing from the Meikô-zukan zokushû. Anyway, all the extant sources and reference pieces do not allow us more precise statements. But it is highly unlikely that it took him, as fully trained armourer, nine or ten years to forge decent sword blades. On the other hand, the obituary record of the Tôkyô´s Myôkanji (妙観寺) where Kotetsu is buried, which lists Keichō one (1596) as his year of birth, is a circumstancial evidence we can´t brush aside that easily. Maybe the answer lies somewhere in the middle. It is namely possible that he arrived in Edo in the mid 1640´s but continued to work there as an armourer. This is namely backed up by an exact copy of an armour by Kotetsu of which the signature was also copied 1:1. This copy was made by the Edo katchū-shi Asai Katsushige (浅井勝重) and the choice of characters for his name allows us to date the original piece to the first year of Kanbun (1661). That means for at least five years Kotetsu still occasionally made armours while he was already working as a swordsmith. The next big question is who was his master to become a swordsmith? Let me say straight off: This question too is not entirely solved. Suishinshi Masahide (水心子正秀) assumed that it was the 5th generation Ise no Daijô Tsunahiro (伊勢大掾綱広, 1616-1683) who also worked in Edo´s Shitaya district (下谷) for a certain time. But, from the point of view of workmanship, we can´t see any connections between the two smiths. The commonly accepted theory is that Kotetsu´s master was the 1st generation Izumi no Kami Kaneshige (和泉守兼重) who worked in Edo for the Tôdô family (藤堂). Some also say it was Kaneshige´s son, the 2nd gen. Kazusa no Suke Kaneshige (上総介兼重), but this does not match for chronological reasons because the latter smith was active somewhat later than Kotetsu. The 1st gen. Kaneshige came originally from Echizen too and his workmanship is quite similar to Kotetsu´s. However, after Kotetsu gained some fame because of the sharpness of his blades, he was employed by the Nukada fief of Hitachi province. Extant records say he worked for this fief from the third year of Manji (万治, 1660) to the second year of Kanbun (1662). After that he was hired by Inaba Masayasu (稲葉正休, 1640-1684), a hatamoto and the daimyô of Mino´s Aono fief (青野藩). He worked for him until Kanbun ten (1670). Masayasu´s uncle Inaba Masafusa (稲葉正房) was, by the way, a retainer of the Fukui fief, so it is possible that this employment was arranged via this connection. But it has to be mentioned that Kotetsu always worked from the Edo residences of his employers. According to transmission, Kotetsu died on the 24th day of the sixth month of Enpô six (延宝, 1678), and if Keichō one is correct as his year of birth then he enjoyed a very long life of 82 years. The cause of his death is unclear but some speculate that his exaggregated ambition to forge whenever possible was the result of a psychosis and that he eventually commited suicide by drowning himself in a well in Hirokôji (広小路), in Edo´s Ueno district. But it is possible that the story with the well is a confusion with the swordsmith Inoue Shinkai (井上真改) because, according to transmission, the latter fell completely drunk into a well and died at the young age of 53 in Tenna two (天和, 1682). So far the outline of Kotetsu´s career and a brief reference to his possible masters. In terms of interpretation of the jiba, the most obvious similarities can be seen with Izumi no Kami Kaneshige, and early tang finishes suggest a connection to Kaga smiths, but there are many indications pointing towards Fukui, i.e. the capital of Echizen province. And as mentioned at the beginning of this article, I want to present another one, a strong indication that he was trained by an Echizen-based master. This indication is the wakizashi shown in picture 4. It has a nagasa of 55.1 cm and a shallow sori of 0,6 cm, is in shinogi-zukuri with an iori-mune, has a noticeable taper, and a chû-kissaki. It is signed “Nagasone Okisato – dôsaku kore o horu” (長曽祢興里・同作彫之) and from the signature style it can be dated to the Meireki era (明暦, 1655-1658) which means although undated, we have here one of the earliest extant sword blades of Kotetsu. Interesting is on the one hand the very clear jigane and bright habuchi, a feature so typical for him, but far more interesting are on the other hand the horimono. We see on the omote side an engraving of a bamboo and on the ura side of a plum tree. This peculiar combination goes back to Echizen Yasutsugu, or rather to his copy (see picture 5) of the meibutsu Baichiku-Sadamune (梅竹貞宗, lit. “Plum and Bamboo Sadamune”) which was once presented by Tokugawa Ieyasu to Nagasaka Charikurô Nobumasa (長坂茶利九郎信政, ?-1572). Picture 6: Well-known baichiku horimono on an Echizen-mono. Later on, this utsushimono of master Yasutsugu served his successors and several local, i.e. Echizen-based smiths as model for own but successively more and more similar interpretations of the baichiku horimono sujet with more emphasis on the plum blossoms (see picture 6) which in turn became over time a trademark of Echizen-mono. So in my opinion it is not a coincidence that we find a horimono sujet famous for Echizen blades on a very early blade of Kotetsu It is namely rather unlikely for me that if trained solely by Kaneshige, he added such a horimono just to remind of his Echizen roots and without any scholastic connections to local Echizen smiths. Again, it are mostly such individual pieces which allow us over years and decades to draw bit by bit a clearer picture of the careers of certain smiths.